Specialty chemicals are mainly produced by a complex as well as interlinked industry. These chemicals are a type of chemical product which are mainly sold based on their function and performance, instead of their composition. Such chemicals either can be found as a single-chemical entity or as complete formulations. Their composition helps in enhancing the performance as well as processing of customers’ desired product. With rapidly mushrooming urbanization, industrialization, and increasing standard of living, the requirement of high-performance chemicals like specialty chemicals is rising at a breathneck speed. This is majorly responsible for driving the global specialty chemicals market. As per expert analysts, the global specialty chemicals market is expected to register a valuation of US$1,210.1bn by 2023-end. This growth is predicted to occur at a promising CAGR of 4.7% during the forecast period from 2017 to 2023. Flourishing agriculture industry worldwide, and growing demand for agrochemicals are fueling the global specialty chemicals market. The market is mainly segmented on the basis of product and region. On the basis of product, the global specialty chemicals market has been divided into following segments – cosmetic chemicals, food additives, textile chemicals, agrochemicals, water treatment chemicals, construction chemicals, ink additives, oil field chemicals, and paper & pulp chemicals. The construction chemicals segment registered the highest share of 22.3%. This is due to the rising urbanization such as growing housing projects and public infrastructure in developing countries, which further augments the demand for specialty construction chemicals, specially adhesives and sealants, protective coatings, asphalt additives, and concrete admixtures. However, in high-end markets such as Central and South America, Asia Pacific, and the Middle East and Africa, the popularity of construction chemicals is expected to continue. Apart from construction chemicals, agrochemicals is expected to witness highest share of 13.5% in the next few years, especially during the mentioned forecast period – 2015 to 2023. This is mainly due to the rising demand for improving quality and quantity of yield from agricultural industry. Geographically, Asia pacific is expected to grab 54.4% of the global specialty chemicals market value by 2023 end, as the region has seen rapid industrialization. Rising demand for specialty chemicals from agricultural industry, growing paper and textiles industry, and increasing disposable income could be responsible for fueling specialty chemicals market in this region. Countries like China and India contributes more in this regional market as these countries have witnessed high extent of agriculture trade and exports along with rapid growth in paper and textiles industry. Apart from these, rising consumption of paper and apparel, and rapid establishment of several manufacturers are also expected to boost the global specialty chemicals market. A competitive vendor landscape exists in this market thanks to the presence of innumerable players. Some of the prominent players operating in the global specialty chemicals market are The Dow Chemical Company, BASF SE, INEOS Group AG, Clariant AG, Eastman Chemical Company, and Evonik Industries AG, and Akzo Nobel N.V. This report analyzes and forecasts the specialty chemicals market on the global and regional level. The study provides historic data of 2014 along with forecast from 2015 to 2023 based on revenue (US$ Bn). The study provides a decisive view of the specialty chemicals market by dividing it into product, application, and regional segments. Product segments have been analyzed based on current trends and future potential. The market has been estimated from 2015 to 2023 in terms of revenue (US$ Bn). Regional segmentation includes current and forecast demand for North America, Europe, Rest of Asia Pacific, Latin America, and Middle East & Africa. These regions have been further sub-segmented into countries and sub-regions with relevance to the market. Segmentation also includes demand for individual product type and applications in all regions. The study covers drivers and restraints governing the dynamics of the market along with their impact on demand during the forecast period. Additionally, the report comprises opportunities in the specialty chemicals market on the global and regional level. The report includes detailed value chain analysis to provide a comprehensive view of the specialty chemicals market. Analysis of Porter’s Five Forces Model has also been included to help understand the competitive landscape in the market. The study encompasses market attractiveness analysis, wherein applications have been benchmarked based on their market size, growth rate, and general attractiveness for future growth. The market has been forecast based on constant currency rates. Prices of specialty chemicals vary in each region and are a result of the demand-supply scenario in the region. Individual pricing of specialty chemicals for each product has been taken into account while estimating and forecasting market revenue on the global level. Regional average price has been considered while breaking down the market into product segments in each region. The report provides the size of the specialty chemicals market in 2014 and the forecast for the next eight years. Size of the global specialty chemicals market has been provided in terms of revenue. Market revenue has been defined in US$ Bn. Market size and forecast for each product segment has been provided in the context of global and regional markets. Numbers provided in the report are derived based on demand generated from different product types of raw materials. Market dynamics prevalent in North America and Europe have been taken into account for estimating growth of the global market. Market estimates for this study have been based on revenue. Demand for specialty chemicals has been derived by analyzing the global and regional demand for specialty chemicals in each product segment. 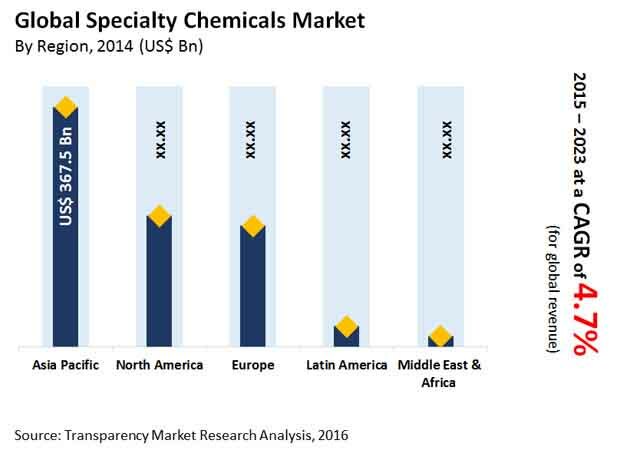 The global specialty chemicals market has been analyzed based on expected demand. Market data for each segment is based on revenue. Prices considered for calculation of revenue are average regional prices obtained through primary quotes from numerous regional suppliers, distributors, and direct selling regional producers based on manufacturers’ feedback and application requirement. Forecasts have been based on expected demand in the specialty chemicals product segment. The global product segment split of the market has been derived using the bottom-up approach, which is cumulative of each region’s demand. Regional demand is the summation of sub-regions and countries in the region. Companies were considered for market share analysis based on their product portfolio, revenue, and manufacturing capacity. In absence of specific data related to sales of specialty chemicals by several privately held companies, calculated assumptions have been made in view of companies’ product portfolio and regional presence along with demand for products in their portfolio. The report covers detailed competitive outlook that includes market share and profiles of key players operating in the global market. Key players include BASF SE, The Dow Chemical Company, Bayer AG, E. I. du Pont de Nemours and Company (DuPont), INEOS Group AG., Ashland Inc., Clariant AG, Huntsman Corporation, Arkema S.A., Evonik Industries AG, Chevron Philips Chemical Company, Syngenta AG, Albemarle Corporation, Chemtura Corporation, Eastman Chemical Company, Solvay, and Akzo Nobel N.V. Company profiles comprise attributes such as company overview, brand overview, financial overview (in terms of financial year), business strategies, and recent/key developments.